Three years ago I began to follow one hell of a fascinating adventure. No, this is not about unclimbed peaks to ascent, no amazing ‘firsts’, no ‘never before done’ by mankind. In fact, the adventure is something that was done a long, long time ago – at least in human evolutionary terms. 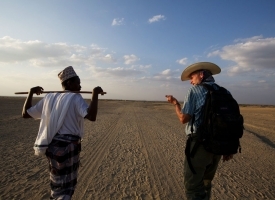 An individual by the name of Paul Salopek, a Pulitzer prize winning journalist and a National Geographic Fellow, decided on a 21,000 mile (34,000 km) walking journey called Out of Eden which started in Ethiopia and will stretch out over several years all the way to South America. His dispatches make for fascinating reading, much more so for me and others who have participated in TDA Global Cycling Expeditions. This is because quite a bit of the terrain he covers is familiar territory. By looking at a map the viewer will quickly recognize the similarity of the route to the outline of 7 Epics that TDA runs. It is for that reason that reading his dispatches brings back memories of our own adventures and experiences, the sights and smell of the places and the people he encounters. His current report is from Kazakhstan a country which the Silk Route participants who started the tour just a few days ago – mind you in the opposite direction from Beijing – will be cycling through in 7 weeks or so. Salopek’s latest dispatch talks about the most precious life giving commodity water, which all of us cycling the desert parts of the world have pretty good appreciation of – see my own blog from cycling through the heart of Australia and one I wrote on World Water Day. 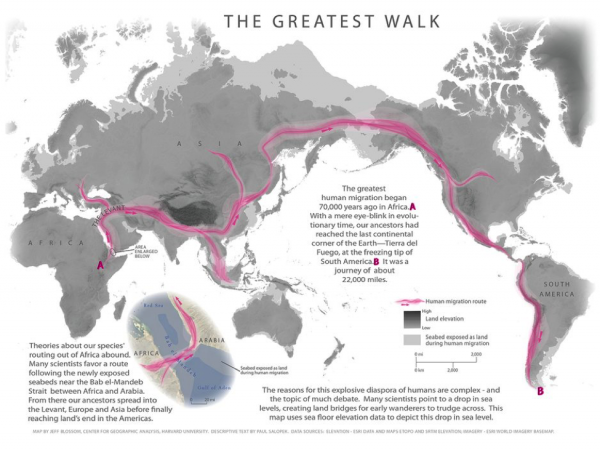 What makes his walk even more fascinating for me and what I have never realized when over the years we added one cycling epic after another is that our 7 Epics somehow follows the routes of humanity dispersal from Africa. 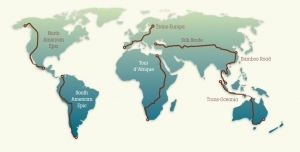 And, of course, TDA Global Cycling started with the Tour d’Afrique tour, the place of humanity’s birth and its source of subsequent dispersal. It almost begs the question – do we all carry a genetic memory of human migration – a concept that has been studied by scientists in the last decade or so? My life partner often tells others when we are in a new place and lost that I have an internal GPS in my head but is there something more to this joke? 0 comments for "7 Epics and the Greatest Walk"
Leave a comment for "7 Epics and the Greatest Walk" by visiting the original post on our TDA Global Cycling blog.